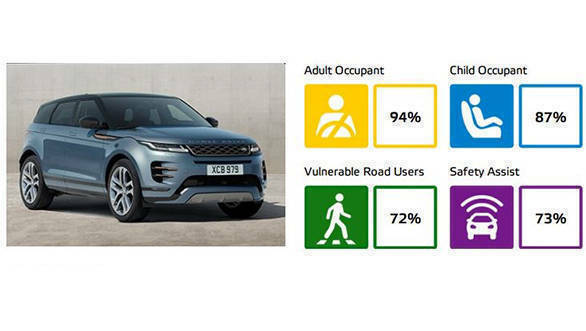 The 2019 second generation Range Rover Evoque SUV scored a full five-star rating in the Euro NCAP. The second generation Range Rover Evoque is expected to be launched in India by the second half of 2019. The premium compact SUV scores 94 per cent in Adult safety and has 87 per cent in the child occupant. The SUV also gets 72 per cent for pedestrian safety and 73 per cent in safety assist. Following the Range Rover Velar and Land Rover Discovery SUV, the 2019 Range Rover Evoque is the third SUV to bag a full five-star rating in the family. 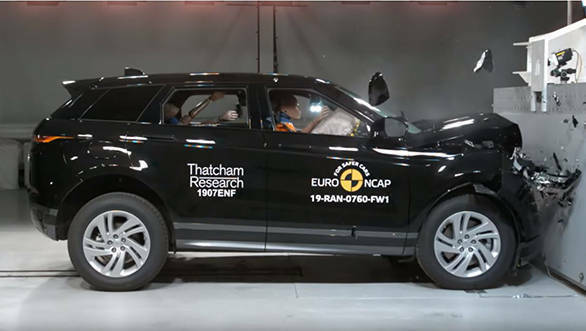 The 2019 Evoque that went through the test was equipped with the active bonnet, AEB Pedestrian, AEB Cyclist, AEB City, AEB Inter-urban, Speed Assistance, Lane Assist System. That said, the India spec car could miss out on some safety features seen on the international model. The 2019 Evoque has been spotted on test in India which indicates a sooner launch. Expect the new Range Rover Evoque to break cover by mid-2019. Post its launch, the new Land Rover Range Rover Evoque will rival the BMW X3, Audi Q5, Mercedes Benz GLC, Volvo XC40 and the Jaguar F-PACE. The new generation will have a 2.0L four-cylinder petrol engine that produces 249PS also the new Evoque will come with a mild hybrid 48-volt motor which will have a combined output of 300PS. The 2020 model year Evoque is lighter because it is based on a new platform which in result would increase the performance of the Crossover. A 2.0L diesel engine producing 180PS will be offered as well for the Indian market.